Our knowledgeable, experienced and service-oriented staff can help you rent the right equipment for your next project at the best prices in town. Judd’s Rental is a STIHL Authorized Service Center, so call on us for all of your sales and repair needs. We have proudly served the tri-cities for 50 years and look forward to 50 more! JUDD’s Rental is Midland’s Only STIHL Elite Dealer! Engineered in Germany and made right here in the U.S.A., STIHL chainsaws are manufactured with their own bars and chains to ensure they meet our quality standards. This is one of the reasons why both professionals and homeowners have made STIHL the top-selling chainsaw brand. By offering STIHL authorized sales and repair, we repair any problem that may arise with your equipment with no less exacting standards. 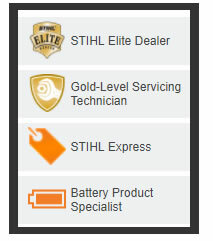 We look forward to serving all your STIHL authorized sales and repair needs. We provide prompt service if problems arise with your equipment. If so, we can assemble equipment and provide you with operating and safety instructions. STIHL sponsors “Independent We Stand,” a national movement of independent businesses dedicated to educating their communities about the benefits and importance of “buying local.” You will be supporting local businesses by renting tools and equipment with us to put money back into the local economy! Customers have called STIHL branded chainsaws “the best chainsaw made.” The affordability and variety of top-quality gas and electric chainsaws are just a couple of the reasons they are the #1 selling chainsaw in America. Our satisfied customer’s list ease of starting, ease of operation, dependability, performance and easy maintenance among the factors that lead them to choose these products.